Giovan Battista Farina, youngest of the Farina children and affectionately known in the family as Pinin [the little one] worked with his older brother in the Farina factory [Stabilimenti Farina] in 1930, before branching out on his own. 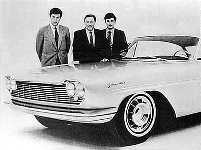 That year, the Farina brothers built a first custom body on a Cadillac chassis. It was a special three-passenger roadster commissioned by an Indian potentate, the Maharajah of Orccha. This unique car was built on the rare sixteen-cylinder chassis of the Cadillac Series 452 designation. A full description of this exceptional automobile may be found in the Dream Cars section of the Database for bespoke models from 1924 through 1934. 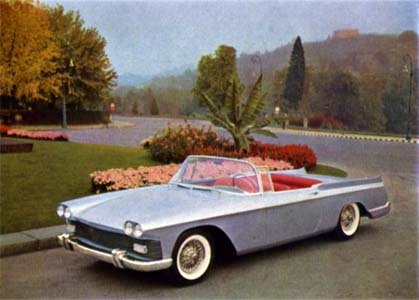 In 1953, Luigi Chinetti, the well-known New York Ferrari importer, commissioned Pinin Farina to build a racy 3-seater sports roadster, again on the 1953 Cadillac chassis. That car was completed in 1954. It is described also in detail in the Dream Cars section of the Database for bespoke models from 1946 through 1955. Both the foregoing jobs have survived, although - in my opinion - both were subsequently "spoiled" by over-restoration and customization in the USA. 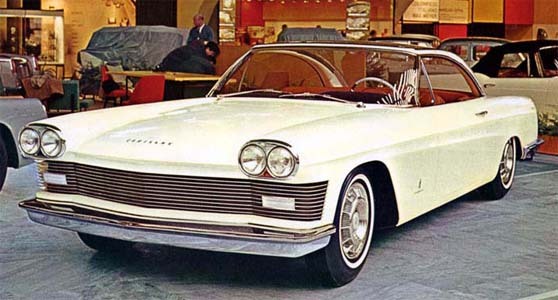 Between 1958 and 1961, the Italian coach-builder Pinin Farina - whose company name was changed to Pininfarina (in one word) in 1961 - drew great inspiration from the Cadillac Eldorado Brougham project. During that time, he designed and built four more exclusive, custom bodies. 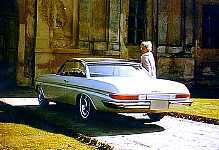 At the time, these were assumed - mistakenly - to have been built on Eldorado Brougham chassis. Pininfarina carefully avoided acknowledging or denying the rumor. Two of these PF "specials" sported Brougham wheels, or at least the turbine blade wheel covers of the second generation Broughams (those assembled in Italy). Contacted in 1976, Pininfarina's customer relations department hinted to me that their Cadillac Jacqueline model had been mounted originally on a Brougham chassis and then, subsequently, put on a special tubular structure. It was only after closely inspecting the car when it was on display at the annual Geneva Motor Show, in Switzerland, in 1991, that I found it to be an engineless shell [a pushmobile] effectively mounted on a tubular framework and fitted with Brougham look-alike wheels. The special Pininfarina models of 1958 through 1961 are described below. Of these four cars, only one of them - the Jacqueline - is known to have survived That car remained for many years in Pininfarinas own collection in Turin. In 1976 I had inquired if it might be for sale. The answer at that time was a definite "No." 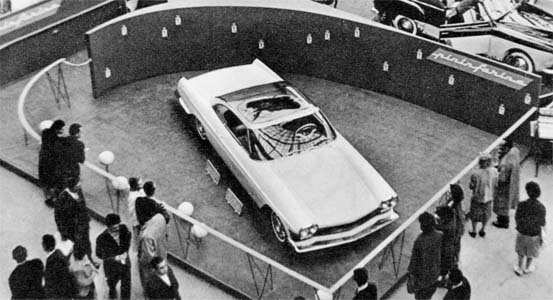 Late Extra (6/2005): The PF Skylight coupe was alive and well in 1970 [see below]. Where is it today? The photos in the lower row shows the car to be painted a light metallic gray with bright red upholstery. This color combination was confirmed to me by Pininfarina in 1976. As explained in the previous paragraph, it seems possible that this and the previous model were one and the same car. In that case - in my opinion - the convertible came first, then a coupe roof was added, the car was repainted and the interior upholstery was replaced. Perhaps some Italian aficionados might be able to help put these interesting PF styling exercises in the right order. B&W photos supplied by Pininfarina's customer relations department, in the mid-seventies [below], show this to be a light-colored car. It was originally black with a white roof as asserted by the manufacturer in reply to a question I had asked at that time [photos above]. The was later repainted a lighter (metallic) hue color for the (later) Turin show. I am now convinced that this car and the convertible model above BOTH are derived from the B&W coupe shown at Geneva in March, 1958. Indeed they are very much alike, except for the matching angular hard-top roof and the gaping front hood air scoop mounted on (one of) the coupe(s). in 1970 for $5,500; will it ever show up again? 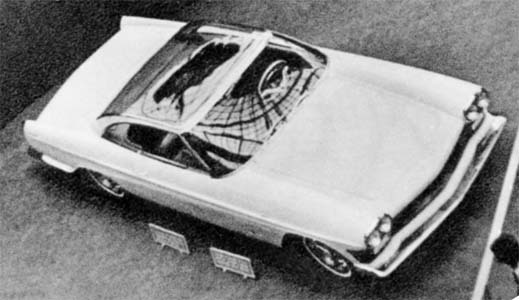 Pininfarina asserted in 1976 that the Skylight coupe and convertible models(s) were mounted on a Cadillac chassis, standing at 130 inches. Since the 1957-58 Cadillac Eldorado Brougham chassis measures 126 inches, and the Series Sixty-Special chassis of 1958 measures 133 inches, obviously it was neither one of these. 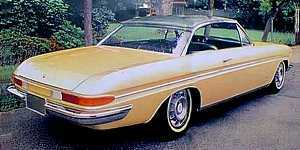 On the other hand, in 1959, the chassis for both the Brougham and the Series Sixty Special models measured 130 inches. My heart skipped a beat thinking that this car could be the missing 1959 Eldorado Brougham [#100?] ... 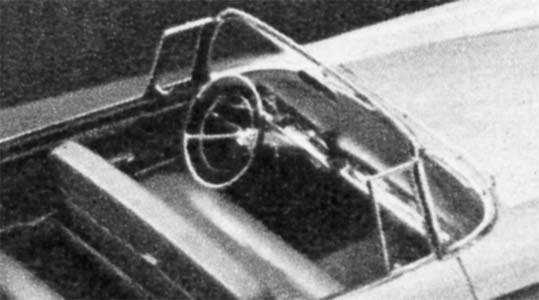 However, the Italian coach builder asserted that the Skylight coupe had been shown first at the 1958 annual Geneva Motor Show, which is held in March. 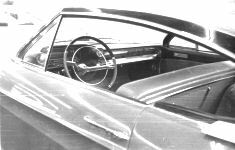 It is improbable [even impossible] that the latter could have been mounted on the 1959 Eldorado Brougham chassis, since the latter did not become available until the Fall of 1958. So either PF is confusing the Paris and Geneva salons, or - as I suspect - the Skylight model(s) both were non-runners [pushmobiles], like PF's later Jacqueline model, below. I would be interested to hear from anyone who attended both these shows or who actually saw photos of the two Skylight models [coupe and convertible] taken together. Late Extra (6/2005): Well, I did hear from one enthusiast, assistant attorney Michael W. Schultz, from Houston TX. Mike did not see the two cars together, but he did send me a startling ad from the December 1970 Classifieds in Hemmings Motor News (p.1324). Offered there for sale, for $5,000.00, in a ¼-page ad, is what appears to be the light-colored coupe with the air scoop). There appears to be a slight difference in the shape of the tail fins. On the original, they were turned up at the extremity; in the ad photo, however, they appear to have been shaved to almost horizontal ... or the photo detail is unclear. 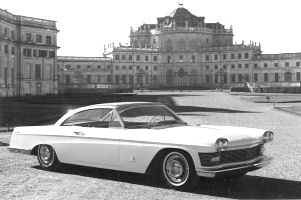 The text reads: Unique Cadillac - 1957 motor, chassis, 1959 custom body by Pininfarina, Torino, Italy. Perfect condition. Can be inspected at Vicmar Garage, 8 E. 83rd Street, New York, NY 10008. Mileage over 50,000 - Asking $5,000.00. The text was "signed" H.V. T. Schwier, 342 Madison Avenue, New York, NY 10017. The phone number 697-4639 was listed. When I corresponded with Fredy Valentini of PF's PR department in 1976 (i.e. some six years AFTER publication of the Hemmings ad), he did not hint that the Skylight had survived, even less that it had been sold. If the ad is true, I wonder where the car is now? Did it find a buyer? Is it still around? A Google search [in June, 2005] reveals that there is still a Vicmar Garage Corp. operating a parking garage at 8 E. 83rd Street, New York. The telephone number listed is 212-650.0675 ... if anyone is interested! This car had an interesting Plexiglas top with an ingenious "headliner" consisting of four articulated metal panels which, when not in use, could be stored, singly or all together, behind the parcel shelf. 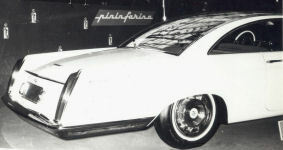 According to a Pininfarina spokesperson in 1976, the Starlight coupe was first shown at the Paris Salon in October, 1959. He was unable to provide the Cadillac chassis number - for this or the next car - although he implied that it had been built on the Eldorado Brougham chassis for that year. Some time after I had inquired about this car from PF, in 1976, an enthusiast with deep pockets appears to have come along with a very thick wad of $100 bills; he was able to walk off with the engineless pushmobile. Jacqueline was for some ten years [1996-2006] in the private collection of Alain-Dominique Perrin, CEO (former CEO?) of Franmce's Cartier group. Prior to that, it was owned by Hervé Willems [aka Irving Willems] of Texarkana, CA. Jacqueline was acquired from Pininfarina by Philippe Lancksweert, a Ferrari importer in Brussels. He later sold the car to his friends, Michel Kruch and Herve Willems. Willems later bought out his partner, Kruch. I got a couple of faxes concerning Jacqueline from a Mr. Benoît Couturier, from Paris, in July/August 2001; he has a droll sense of humor; his tone is both caustic and sarcastic. In his first message he asserted that all the information I had on Jacqueline was mere hearsay and gossip by people who only think they know the facts; he said I was "wandering about in a thick fog" and that I was the "world's champion" at reporting half-truths. Well, Mr. Couturier, as I was quick to point out in the Foreword to The (new)Cadillac Database©, "facts" from different sources sometimes are contradictory. Included here, therefore, are only those "facts" drawn from the source(s) which, in my opinion, seem the most reliable. It is for you, the user, to point out any errors, omissions or inconsistencies you may come across so that, together, we can improve the Database and thus better serve the hobby. That said, in his second message, Benoît suggested that I contact Michel Kruch, in Brussels, who knew of the car when it was in the museum there; unfortunately, he did not give me Mr. Kruch's address. He said that he (Couturier) had bought Jacqueline from Hervé (Irving) Willems in 1996 (although Mr. Willems' name sounds Belgian, in fact he is of French origin; his father operated a print shop in Senlis, south of Paris). This turned out to be a lot of b/s. In fact, Couturier is said to be a disreputable used car salesman in Paris, France. The REAL owner was Alain-Dominique Perrin. Benoît claimed that Jacqueline had been built on a 1959, Series 69 chassis (Eldorado Brougham). In fact, the car was a pushmobile, from 1961 uop to 1996, when it was put on the chassis/drivetrain of a 1960 Cadillac Eldorado Biarritz; it turns out that the Biarritz' motor was swapped out some time in its life and carried a regular '59 engine with one single, 4-barrel carb - no tri-power unit (Frank Tetro of Harbor Auto Restorations in Florida, who did the conversion, has the details). 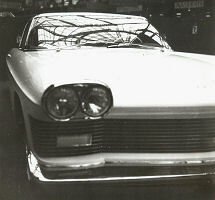 Benoît was "absolutely convinced" that there were (at least) TWO Jacqueline prototypes; he claimed to own #1; he implied that the one I saw in Geneva (that car was on loan from the Pininfarina museum and has been widely photographed), was NOT his car; he asserted that the Jacqueline shown at the Paris Salon in 1961 was NOT white and referred me to a photo in a book on Cadillac published by EPA in France (unfortunately, the EPA book in my collection, published in 1985, dos not include any photo of Jacqueline - does any reader have the EPA book to which Benoît referred?). Nonetheless, the B&W photo I have of the car, taken at the Paris Salon, shows a very light colored car; I would imagine that a gold-colored car, like the one claimed to be owned by Mr. Couturier, would appear light gray in a B&W photo. The "Couturier car" attracted large crowds, at the Concorso Italiano (the show of Italian automobile elegance) in Monterey, CA in August 1999. The surprise was that it arrived under its own power. As I have stated above, the transformation was done by Frank Tetro, in California. 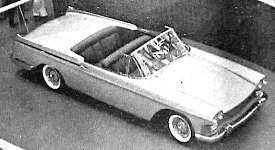 PF's Jacqueline coupe was built in honor of Americas then first lady, Jacqueline Bouvier-Kennedy. 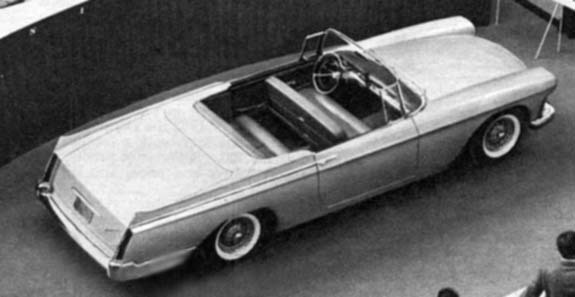 It was implied, that this car was built on a 1959 Eldorado Brougham chassis [possibly because of those unmistakable turbine wheels ...or wheel covers, more likely], then removed from that chassis and put on a tubular structure. When I crawled under the car at the Geneva Motor Show in 1991, I was indeed shocked to find that this "automobile" could not possibly move under its own power as it had neither engine nor drive-train. 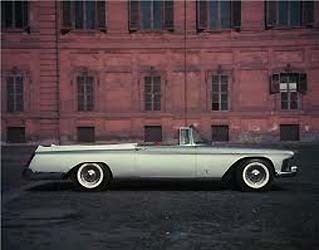 Am I to conclude, therefore, that all Pininfarina Cadillac show cars were "immobile" pushmobiles and not "automobile"? The PF customer relations department asserted also, in 1976, that there was no Jacqueline script on the leading edge of the car's front fenders when it was shown in Paris; the name, he said, was added later, for the Turin show. Nonetheless, I have a photo (below) taken at the Paris show where the Jacqueline nameplate may be clearly seen. Collectible Automobile published some photos and a story about Jacqueline in January, 1996. At that time it was said (correctly) to be owned by Irving Willem [aka Hervé Willem] of Tarzana, CA. The writer of the CA article asserted: To pique Caddys interest the coach builder showed two [?] 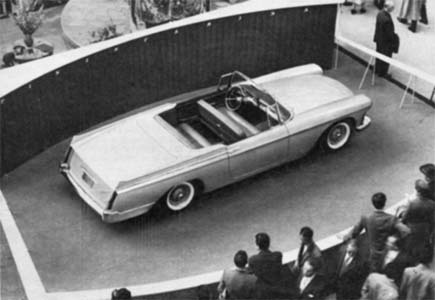 Brougham proposals of its own at the 1961 Paris Salon de lAutomobile. One was a four-door [??? ], the other [?] a two-door hardtop; both [?] were dubbed Jacqueline, ostensibly in honor of the new American First lady. (...) The golden [???] two-door featured a brushed steel roof and no back seat. No description of the second Jacqueline (the alleged 4-door model) was given in that article. Also, I have it from Pininfarina that Jacqueline was painted white, not gold. In my opinion, therefore, the writer is mistaken as regards a possible second Jacqueline model. He may have confused that car with the earlier Starlight model [described above], although it too had only two doors, or with the a 1960 Cadillac Eldorado Brougham that may have been on show concurrently in Paris. My interest in the Cadillac Jacqueline was piqued by the correspondence I exchanged in November-December, 2001 with Mr. Couturier, who claimed to have been closely associated with that car since the mid-nineties. Regrettably, he is not a very cooperative nor is he a pleasant person to deal with. He had his own account of the Jacqueline story and was downright rude and equally aggressive when I dared question some of his "facts". My arguments all were founded on information I got directly from Pininfarina's public relations staff in the mid-seventies. As I suffered an "epistolary aggression" in December 2001, "at the hands of" Mr. Couturier, who claimed I knew nothing about the car's history, I decided to create a new page for her. Check it out! Left: Look at that windshield ! Left: unmistakable 1959 Eldorado Brougham front bumper ...married to a Rolls-Rouce grille! Right: '59 Eldorado Brougham rear bumper and tail-lights ...married to some "funny fins"
Trivia: French auto buff Jean Baptiste Dewever sent me two undated (unfortunately) sketches by well-known French carrossier (coachbuilder), Henri Chapron [above] They show two proposals for a custom 4-door sedan on the Rolls Royce Phantom V chassis. Look at these drawings: those lines certainly are reminiscent of the 1959 Eldorado Brougham ! The sketches are numbered 5315 and 5319. Both are signed C. Delaisse. 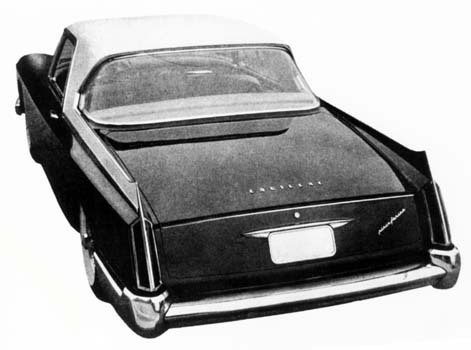 Both sketches feature rear quarters, bumper and tail-light pods that are very reminiscent of the 1959 Cadillac Eldorado Brougham. 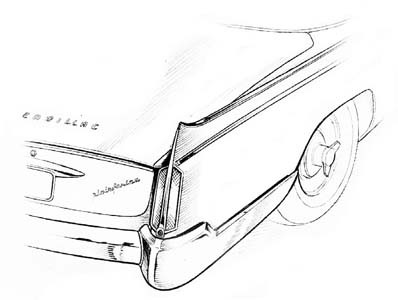 Sketch #5315 features front fender and bumper that are also reminiscent of that Cadillac model. Sketch #5319 features two traditional Rolls Royce front fenders, bumpers and impact guards. The windshield, on the other hand, is an almost exact copy of the '59 Brougham glass, rising high into the roof line. Rolls Royce of England built their Phantom V models between September 1959 and April 1968. Only 516 of them were made over that 8½-year period ...making it a rarer car than Cadillac's Eldorado Brougham with 904 models built from 1957 to 1960. Whether the Chapron Rolls Brougham was ever built, is a matter for conjecture.